(CNN) -- On this month's CNN Business Traveller, Richard Quest gets to grips with the electronic book, road testing the Sony Reader and Amazon Kindle. Richard Quest prefers the Sony Reader for its sophisticated design. 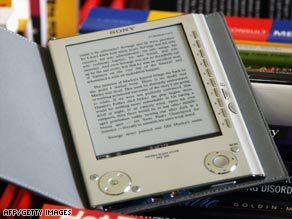 Sony's e-book was launched in 2006 following a series of failed attempts to take books from paper to screen. Late in 2007 Amazon stepped in to challenge Sony. The Kindle is still only available in the United States. Sony's Reader is available in the United States, Canada and United Kingdom. Amazon has not released sales figures but can confirm that Kindle titles account for more than 10 percent of its book sales. It has also currently sold out of devices due to "heavy customer demand." In December 2008, Sony revealed that it has sold 300,000 of its e-books. The two devices use the same "electronic paper" technology that ensures text looks as sharp as it does on paper. Unlike on a computer, the screens are not backlit, which means there's no eye strain when reading. You can read outdoors as well as in. And until a page is changed, the machine doesn't use any power. This means a full battery charge can last for days, if not weeks in the case of the Sony Reader. Navigation tools make it simple to flip through pages or to jump to any spot in a book. Newspapers, magazines and blogs can also be downloaded. Newspaper subscriptions cost around $14 a month and are delivered daily at 3am EST. The Kindle comes with a hefty up-front cost at $359. But each e-book costs only $9.99 to download. There's also an impressive 200,000 titles currently on offer. The major benefit of the Kindle is that it offers free wireless technology. This means books can be downloaded instantly anytime and anywhere. Users can also use the reader as a basic web browser to access e-mails and news. The Kindle can store up to 200 books. Users can e-mail Microsoft Word documents and pictures to the reader for on-the-go viewing. It's also possible to make notes and annotations on books and documents. Kindle's wireless technology doesn't enable you to roam in all countries overseas. Richard Quest failed to connect in two countries. He would also like the reader to be sleeker, smarter and feel less like a computer. The Sony Reader is priced at $299, it comes in a simple design, and weighs just 250g. To ease the eyes, readers can zoom in up to 200 percent and it has a built-in memory to hold up to 160 e-books. Its rechargeable battery powers users through 7,500 page turns or for three weeks. Currently Sony offers a selection of more than 50,000 electronic book titles. And because the Reader supports other e-book formats, including Adobe eBook and EPUB, there are hundreds of thousands of books available from other stores, Web sites and public libraries. Its latest model, the PRS-700, has an interactive touch screen display, it can hold 300 books and costs $400. One downside of the Sony Reader is that you need to attach it to a computer to download books from a special Web site. The allure is its sophisticated and sleek design. Quest didn't miss the feel of the paper page. And he wishes each reader could offer the advantages of the other. On the Sony Reader he would like to be able to make notes and annotations and have better management of material. The Kindle is great for non-fiction, but Quest would prefer a smarter design. But, all things considered, it's the Sony Reader that wins his verdict as the e-book of choice.